AN ALTERNATIVE way of viewing modern art is right on your doorstep after the Wits Art Museum launched their WAM After Hours event earlier this week. The launch took place at WAM in Braamfontein and featured technological art called “Art in Motion”. Many art enthusiasts attended the event and were required to do a walk through the museum before arriving at the common area where drinks, live entertainment and doodling stations were set up. Laura de Harde, one of the tour guides, led people into the museum for their three stop tour. The first exhibition was held on the lower level of the museum and it showcased still art. The art on display was entered into the 2013 Martienssen Prize exhibition with Antonia Brown’s “I will tell him when he comes back” piece which won the award. Brown’s ancient audio recording device demonstrated how language can be lost by showing that once a voice of a person travels over the magnet on the recorder, it is lost forever. Other artists whose pieces were on display included Anathi Bukani and Madeleine Dymond. The next exhibition was held on the second floor of the museum which was called by the guide as “ground zero” of the art museum. Here people were able to get involved with the art as it was technological art. Projector screens with sensors at the bottom caught images of people who walked past and subsequently displayed different images on the screen. The first piece used sound and image to portray art. When a person walked past the screen an outline of the person appeared and surrounding images and words appeared around the outline in a confusing and distorting manner. 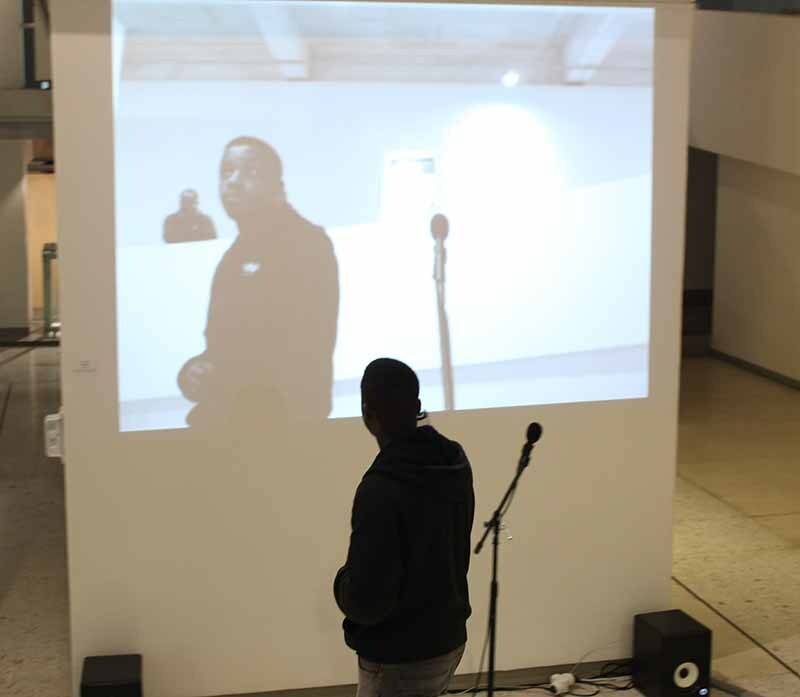 The piece was to demonstrate how image and sound can distort communication. The artist Nathaniel Stern seemed to be expressing a sort of frustration he had with communication. The art pieces by Stern make audiences encounter complex relationships between bodies and language. His artworks forces people to grab text with their bodies, draw letters with our heads and listen with their bodies. A piece by Tegan Bristow involved talking through a microphone and looking at your face on the screen which was replaced with Jacob Zuma’s face. Other pieces captured a person’s energy by representing colourful or dull flowers depending on the energy received by the sensor. Bristow’s pieces invite playfulness between images and interactive engagement with the art. People are able to relate with each other within the frame of the artworks. The last stop of the exhibition was on the third level of the museum. Here people were meant to understand the meaning of words and letters. Another piece by Stern required someone to stand in front of the screen and catch the words flying around them. Once you caught a word a speaker blurts out a non-conformist definition of the word. Bristow and Stern’s artwork asks us about the consequences of our movement and how these physical interactions change relationships we have with others. The purpose of Art in Motion is to show how our actions reflect meaning. 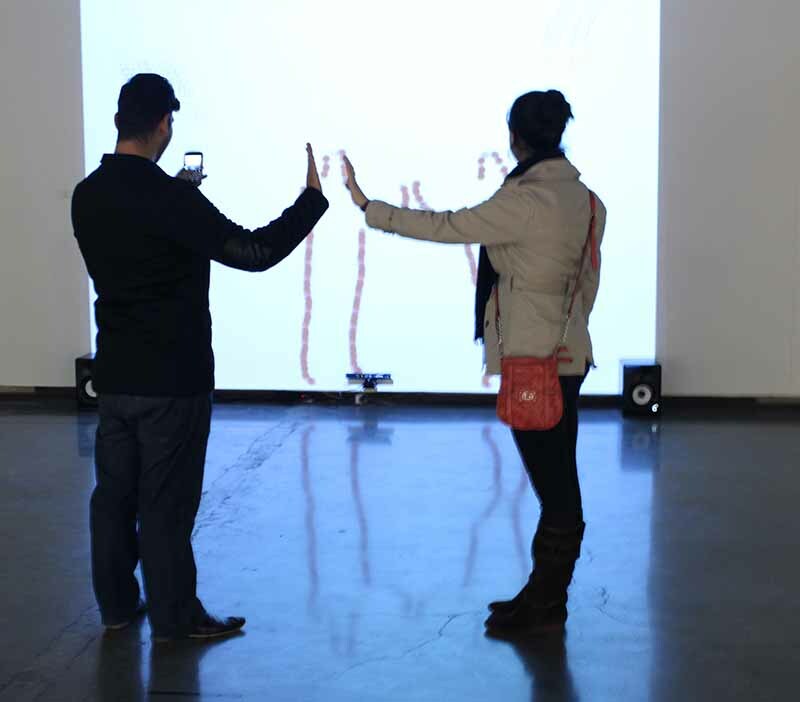 People were intrigued and fascinated by motion art and the attendance was high in the ranks. People experienced as much as they could with the art standings around the museum. Wits Vuvuzela, Zest from the fest. July 19, 2013. Wits Vuvuzela, The art of afroculture. July 26, 2013. Wits Vuvuzela, City of gold shines in Arts festival. April 12, 2013.